Who am I? Well I go by Jace and I live in Oregon. I was born a female in 1984, in southern California. I was an average kid... nothing ever seemed to be wrong with me. I loved playing with ninja turtles, I collected hotwheels and baseball cards. My dad and I went fishing and often visited the batting cages together... those are my favorite memories. I remember when I was in elementary school I was able to sneak off to school and my mom forgot I had pictures that day... well after I had been there for a while I got called tot he office. My mom brought over a flowery dress for me to change into for photos. I was probably wearing jeans and a t shirt or something similar. I remember crying and fighting against wearing that dress. I usually ran around in boys clothes, I hated wearing anything pink/purple/frilly or flowery. It was all boy all the time. When I played house with my friends I was always wanted to be the pretend dad or brother. If you can imagine... what it must be like for a small boy who knows nothing about gender identity except how he feels inside and what feels natural... to live his childhood being dressed up like a girl, using the girls bathroom, havin mom do his hair up in a pony tail, and not knowing why its so unfair that he gets to be treated this way when all the other boys get to be cool and wear their hair short and pee standing up (you get the point). As I look back now, and remember things from my past, I think of the small details such as the baseball caps I had to wear on a daily basis... never really getting along with girls, always having male friends. I was very athletic and loved playing sports. The day I found out that girls had to go through their "changes" I cried, right there at school I cried. I told my mom its not going to happen to me and I swore it. I really belived it wouldnt. The day I went for my first bra, I was humiliated... I just felt like a pre teenaged boy standing in the girls unmentionables section and my mom held a sports bra upto me. I got upset and walked away. Slowly... I started to realize that I was unhappy with my gender. Being a young kid its really hard to identify with that sort of thing unless your exposed to it in some sense. So my whole life I delt with situations like these... But never knew why I felt that way and always figured I was just different... or what people liked to label me as "tom boy". I contuniued to live my life the way society seen fit. When I moved to Oregon I decided... well ill try to fit in with these people so I can make friends. I started to dress a bit different.. not SO boyish.. but never too girly. I made friends with some girls at the high school I went to. I delt with a lot of hate from the guys, at the high school level they dont want to be friends with a tom boy who dresses like a guy. And what guy wants to date a girl who resembles a buddy of theirs? Eventually I turned 16 and was allowed to start dating... I met someone and we fell in love... he made me feel like it was ok to just be a girl and it made him happy when I would dress up for him and do my hair, so I did... and I tried hard to put those strange out of place feelings behind me. Well, I got pregnant, in 2002 and that after I graduated high school we got married, and the following month I had a baby girl. It seemed to be what I thought was what my life was, at the time... all I needed. Someone loved me and wanted a life with me, reguardless of my tom boy ways. I never thought that anything would change. I was just living life, and nobody had to know how I truly felt deep down inside. 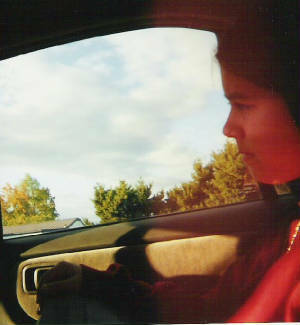 Summer of 2004, a friend of mine came to visit me here in Oregon and she brought a friend of hers along for the ride. His name was Ashton. I was informed he was a pre-T transguy... meaning pre-testosterone, hasnt started his hormone treatement but he was passing as a male fulltime. It intersted me.. to say the least. We went to dinner one of the nights they were down and sat there for a good 3 hours talking about being transgender... and out of nowhere, after he told me how he came to the conclusion of wanting to transition, I looked at him and said I dont believe im gonna say this but I think I am transgendered. From then on... I had done nothing but sit online looking up info... educating myself. It was kinda weird how it all happened but it made so much sense to me when I heard it straight from the mouth of someone in transition... In a way I felt foolish for saying yeah im a man in a womans body... because I was married and had a child... but in other ways I just thought to myself... how can I possibly ignore the things running through my mind and the feelings im getting about this. It was just a blow to the mind to actually hear his and be able to identify with it. I had many questions and lots to learn... for several months I just dwelled on it. From the time I woke up to the time I went to bed I did nothing but think about things like.. "what if I transitioned...?" I fell into a pretty bad state of depression. I fell apart in many ways. My relationship with my husband... aside from other problems we had as a couple, just went to hell because I didnt feel connected to him anymore, I didnt feel like I was me. I felt like I was cheating myself and that I coulda possibly made a mistake by getting married so young... I just felt bad all around. Novemeber of 2004 I decided to come out. I started by telling my best friend Angelina all about the feelings I was having and we spent many late nights at the restaurant havin good long chats about what I was going through. The more questions she asked the better I felt. I was able to teach someone else about it and it made me feel good that someone was able to grasp it and not judge me by it. I started telling other people I was close to... my husband... several other friends... the hardest part was telling my mom. I was so afraid that she would freak, but she didnt. I think she was and still is in somewhat disbelief but she didnt freak and that im thankful for. Most of my family and friends know now. January 2005, I got my hair chopped off. It was almost shaved. I was proud of my new look. I felt good about myself and I felt accomplished. My next step was seeing a therapist. I went to a few appointments and stopped, I explain why in my journal section. I decided I needed some time to really think about everything I was going through and didnt want to move too fast for my own good. It was new and I was stil learning and so I stopped myself. I let my hair grow back a little bit and I try my hardest not to think about being transgendered too often. It really hurts to know that its that difficult to take the proper steps to just be happy. For a long time I have been living for other people and worrying too much about what everyone else thinks about me. Recently... ive noticed signs of depression are reoccuring and I know its because of this. I think I know now for sure that I am in fact transgender and I am looking forward to my journey. I know it wont be easy, but what in life worth having, is easy? Right now all I really need is support from my family and friends. Just because I am changing my gender, it doesn't mean that I am weird or mentally ill. If I was mentally ill, my therapist wouldn't let me do something so extreme. People don't realize that to go through a gender change, you have to do a LOT of work mentally and physically and it is a very depressing thing to go through sometimes. Nobody would choose this for themselves, just as you wouldn't choose to acquire a disease of any form or be born with a birth defect. To me, being Transgender is the same. An unfortunate circumstance, although it can be fixed to help retain a semi-normal life still. Trans people are brave. We stand up for who we are so that we can be happy in this one life we are given. We put ourself through the pain of injections, sometimes humiliation, we deal with loss of family members due to non acceptance, our children have trouble adapting sometimes... but we STILL transition. In my personal experience... I hadn't been true to myself until I decided to transition and until that decision was made, I had bad depression and spent many days in bed. It did no good for my daughter or myself. Now that I am transitioning I feel I can be an active part of society and not feel displaced. I am happier and overall healthier, and I want to be.